This February brings some unique events to Whidbey Island, and the calendar of events this month offers something fun for a wide variety of interests! Want to expand your theater horizons, or spend the month getting in shape for the run at Fort Ebey? You’re in luck this month! Follow the links below the graphic for more details on each event. Hope your 2019 is off to a great start! 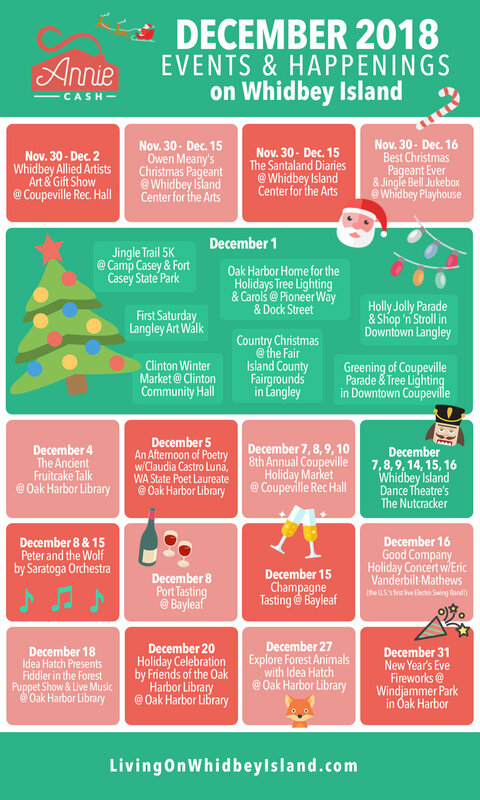 December brings us a calendar filled with fun, festive, and unique events on Whidbey Island! Follow the links below the graphic for more details on each event. Happy holidays! The kids aren’t the only ones having fun this Halloween. Whidbey Island is home to some unique, memorable events for adults to partake in as well, like murder mystery dinners where you get to dress up in costume and professional ballet performances of Frankenstein! As much as we love Oak Harbor, sometimes we want to get off the island for an adventure. What Happens at Holland Happening? The basic rundown on this traditional Oak Harbor festival.